I have found myself stuck in a bit of a money rut recently…I hate the ‘recession’ word….I spend a lot on clothes and bags and shoes blah blah and somehow have always thought I have a limitless fund…well that is not the case. I’m having to curb my spending..the necklaces will be the last splurge for a while..cry cry. When I spend I never really think about whether the item will fit into my existing wardrobe, not just in terms of space which I’m starting to lack, but also if I can pair it with clothes I already have. I would describe myself as an impulse shopper…if I see something I like I normally buy it..and it’s due to this reason that I lack the basics and the essentials. 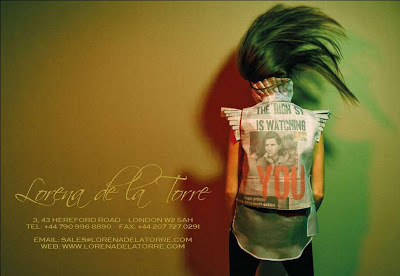 Lorena de la Torre is a Spanish designer who focuses on just that. Her designs are deconstructed and she manages to intertwine fabrics throughout each garment to beautiful effect. She started her own line in 2005 and before this, spent time working for Anna Cortina in Barcelona and also as a fashion consultant for the Japan based brand Enishi. Her A/W 09 collection (above) was showcased at London Fashion Week’s On-Off event. I think the pictures depict the exact way the clothes should be worn. They are fun and edgy with a sense of rock chick creeping through. There needs to be a confidence to pull off the mix of wool and satin in such dark colours. The very first ‘the high street is watching you’ jacket is my absolute fave…the cut is sharp and the ruffled detail around the high neck and shoulders is stunning. Oh, I love it, especially the first one! Those are really nice outfits! I like the collection =) The photos in the subway are fantastic! oo i like it! i felt guilty spending lots too 🙁 oh well were stimulating the economy. i try my best to keep you updated love. keep coming. I like the collection. I hadn’t heard of her before.